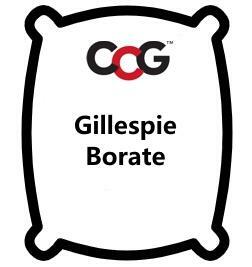 Gillespie Borate is a blended borate mineral for use in glaze formulas replacing Gerstley Borate on a pound-for-pound basis. Consistency - Manufactured from high purity refined raw materials, Gillespie Borate is highly consistent from batch to batch. Oxide Match - Virtually identical to Gerstley Borate, this product requires no adjustment to formula and no extra additives are needed. Mineral Match - Gillespie Borate provides the same minerals to the glaze as Gerstley Borate, thus imparting the same glaze activity, texture and effects. Particle Size Match - As a 200 mesh material, Gillespie Borate combines well with other glaze raw materials. Plasticity Match - A high colloid and clay content gives the plasticity necessary for many applications. Reduced Glaze Defects - Our laboratory studies indicate that Gillespie Borate gives increased glaze surface smoothness and a reduction in crawling and pinhole defects. Lower In Off-Colour Impurities -- As a refined blended material, Gillespie Borate contains few impurities and produces brighter glazes and colours. Special Effects - Excellent glaze texture and activity for specialty glazes. Coloured Glazes - GB works well with most pigments and has an exceptionally wide colour palette. Do not use excess water in mixing the glaze. Store the wet glaze in an airtight container. When using any substitute material always test it in a small batch of glaze. Test the glaze on the same clay body you will use in production. After applying the glaze to several vertical test tiles place them throughout the kiln.